In recent years, the American public has turned its attention to the opioid crisis and the powerful dangers of addiction. But opioids aren't the only form of substance abuse rising in America. A recent study shows both men and women are now drinking more than in years past, and this may be turning into misuse or dependency. Research shows less than 10 percent of adults participated in "high-risk" drinking (more than three or four drinks each day) between 2001 and 2002. However, between 2012 and 2013, that figure increased to nearly 13 percent. According to the Centers for Disease Control and Prevention (CDC), more than 88,000 people died between 2006 and 2010 from excessive alcohol consumption. If adults are drinking more now than in years past, how and when does this habit form? 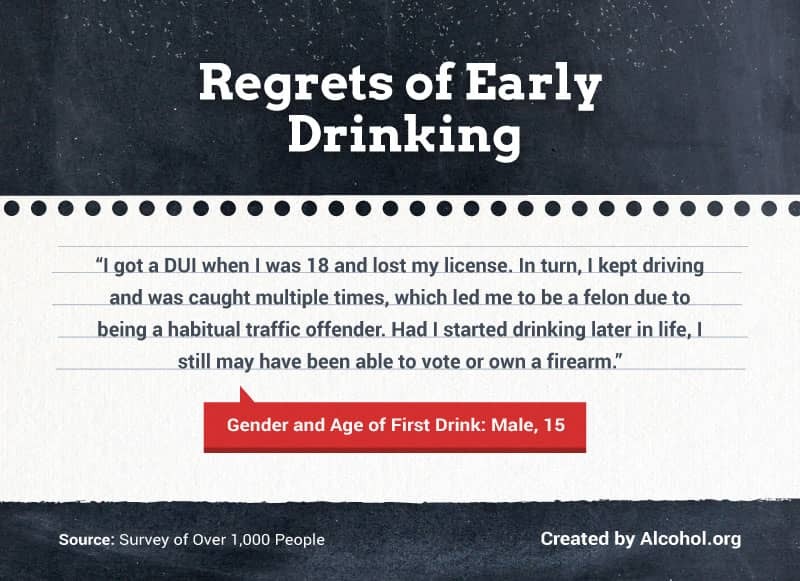 To learn more, we took a closer look at over 1,000 people's first experiences with alcohol. 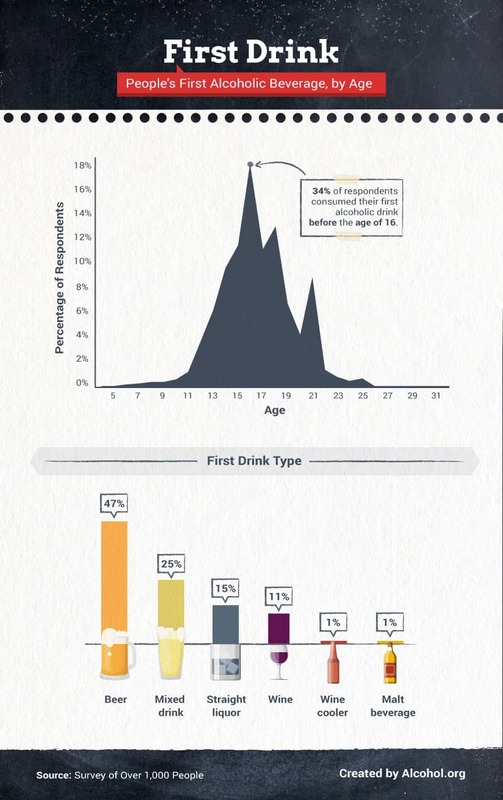 We uncovered how old most people were when they took their first drink, how involved their parents were in this decision, and how often underage drinking led to binge drinking. Read on to learn more. Since 1984, the national Minimum Legal Drinking Age (MLDA) has been 21 years old. While the legal age varied between states prior to this, research has linked underage drinking to brain development issues, hospitalization, and a higher risk for alcohol traffic fatalities. Despite these serious consequences, only 13 percent of people had their first drink when they were 21 or older. 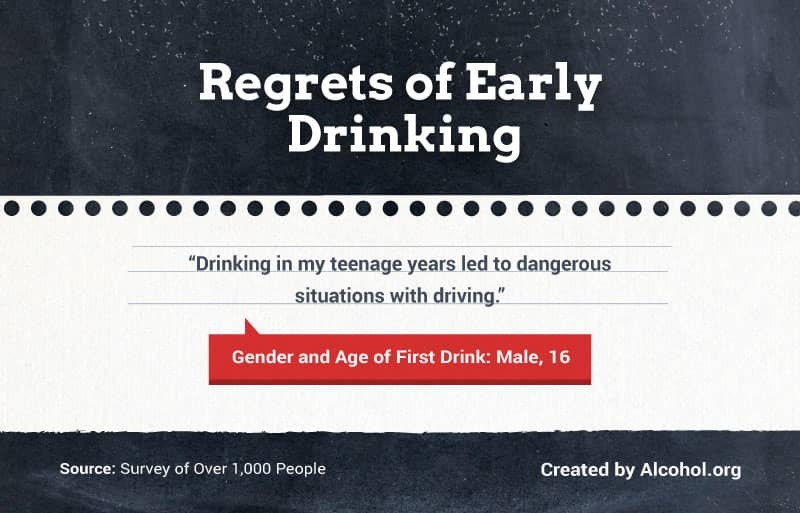 Nearly 1 in 5 respondents admitted to having their first drink when they were 16 years old (the legal driving age), and over 20 percent had their first drink when they were between 14 and 15 years old. For many people, beer was the first alcohol beverage they tried. Beer may be safe for adults in moderation (no more than two glasses a day) but can lead to blackouts, drowsiness, and confusion if consumed in excess. One in 4 participants said their first drink was a mixed cocktail, and 15 percent said they first tried straight liquor. If the first alcohol beverage you tried was beer, you might be more likely to drink more than people who initially had a mixed drink, wine, or liquor. According to the CDC, excessive drinking is defined as having eight or more drinks for women and 15 or more drinks for men per week. 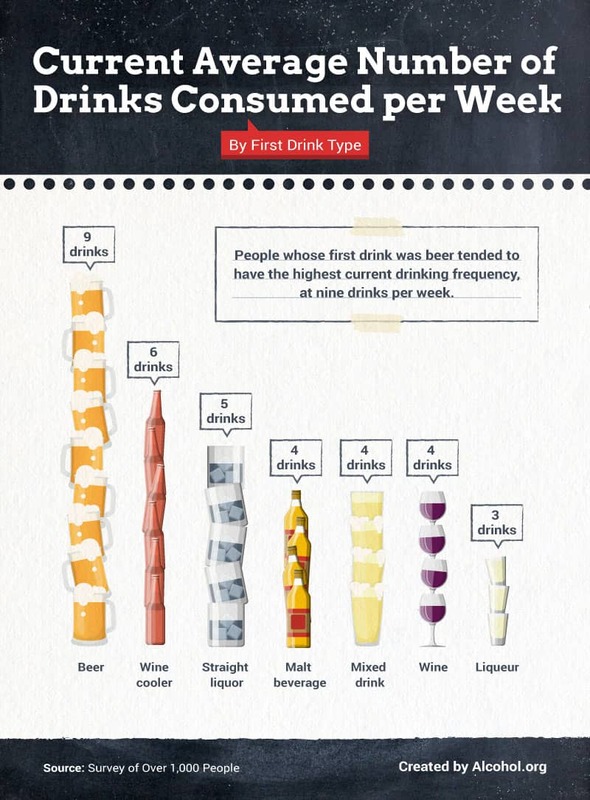 According to our study, people who first drank beer currently drank an average of nine alcoholic beverages per week. In contrast, people whose first drink was a wine cooler reported currently consuming six drinks per week on average, and those who started with straight liquor consumed five drinks on average. People who started with beer drank more than twice as much per week, on average, as those who had a malt beverage, wine, or mixed drink as their first alcoholic beverage. As we'll explore below, underage drinking habits can also lead to an even more dangerous type of consumption: binge drinking. Women and men drinking more than four or five drinks in a row, respectively, is classified as binge drinking. For adults and underage drinkers alike, this produces a blood alcohol level well above the legal driving limit of .08 percent. Studies show 1 in 6 adults binge drink roughly four times a month – the most common and deadly pattern of excessive alcohol use – and the risks can be costly. Aside from violence and sexual assault as well as memory and learning problems, binge drinking is largely attributed to fatal car accidents and unintentional injuries. People aged 20 or younger were nearly twice as likely to binge drink in their first year of consuming alcohol compared to those who waited until they were the legal drinking age. Sixty-five percent of adults who started drinking when they were 20 or younger admitted to binge drinking, compared to 37 percent who started drinking at 21 or older. For some parents, it may seem more sensible to allow underage children to drink alcohol as long as they do so under certain perimeters or supervision. Studies show roughly 1 in 6 parents let their children drink in some capacity by the age of 14, but their decision could be leading to dangerous drinking behaviors. Children 13 or younger whose parents allowed them to drink were more likely to binge drink than those with parents that didn't allow alcohol consumption. 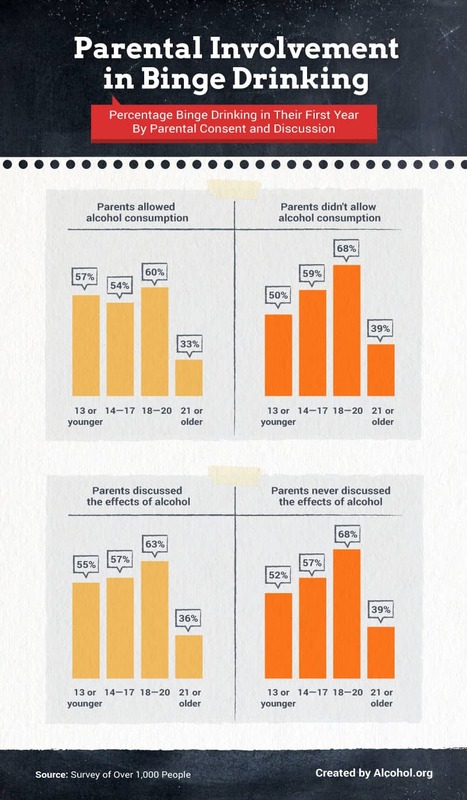 And while some people suggest drinking with your kids (even at a young age) is smarter than hoping they won't drink at all, more than half of respondents admitted to binge drinking between the ages of 14 and 20 when their parents allowed alcohol consumption. As kids get older and closer to the legal drinking age, the conversations parents have with them can help prevent dangerous behavior. While 63 percent of people said they participated in binge drinking between the ages of 18 and 20 despite their parents having discussed the effects of alcohol, they were less likely to do so than the children of parents who didn't talk about the effects of alcohol (68 percent). While most people admitted to drinking out of curiosity in their youth, this curiosity mixed with teenage rebellion and the need to establish independence is a dangerous motivator to drink, especially because the risks are not fully understood. 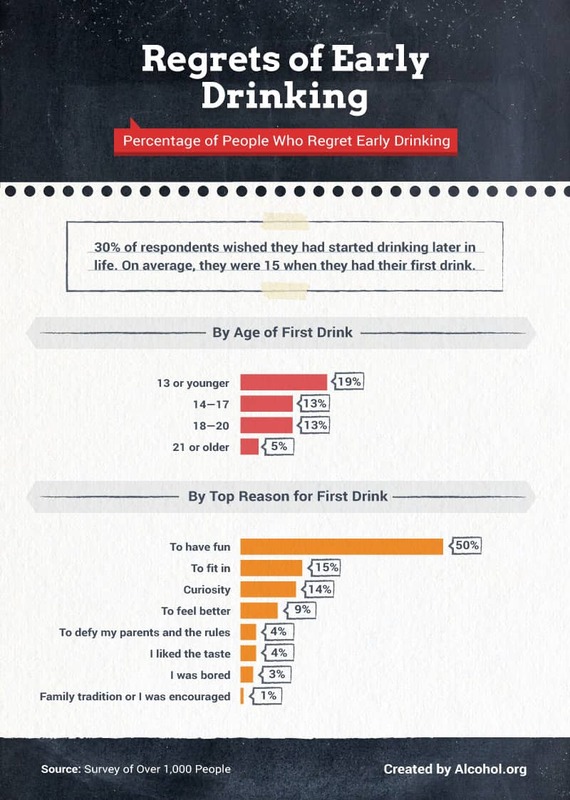 We wanted to analyze how those early drinking motivations impacted current habits. 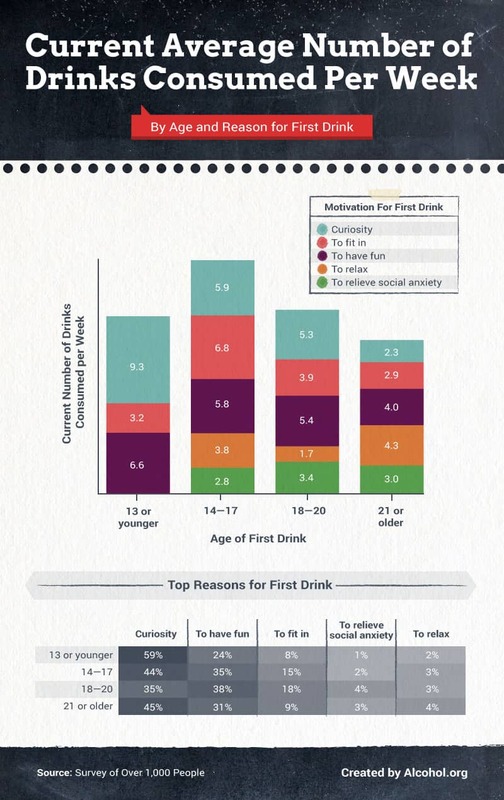 The 59% of respondents who reported that their first drink motivated was by curiosity had the heaviest level of alcohol consumption in adulthood, at around 9 drinks per week.The 15% of respondents, who said they drank to fit in between the ages of 14-17, had the second highest consumption rate in adulthood, at around 7 drinks per week. A majority of Americans today drink to have fun, despite alcohol being one of the most addictive substances on the planet. Because increased alcoholic activity directly impacts the part of our brain that controls dopamine (the "feel good" chemical), drinking can make you feel joy, pleasure, and euphoria. Depending on how much a person drinks, those happy feelings may quickly give way to negative effects including reduced cognitive and physical capacity. Over time, a person may need more and more alcohol to produce the same level of euphoria. This can lead to alcohol abuse, dependence, and even addiction. Despite their curiosity or the promise of a good time, 30 percent of people wished they'd started drinking later in life. 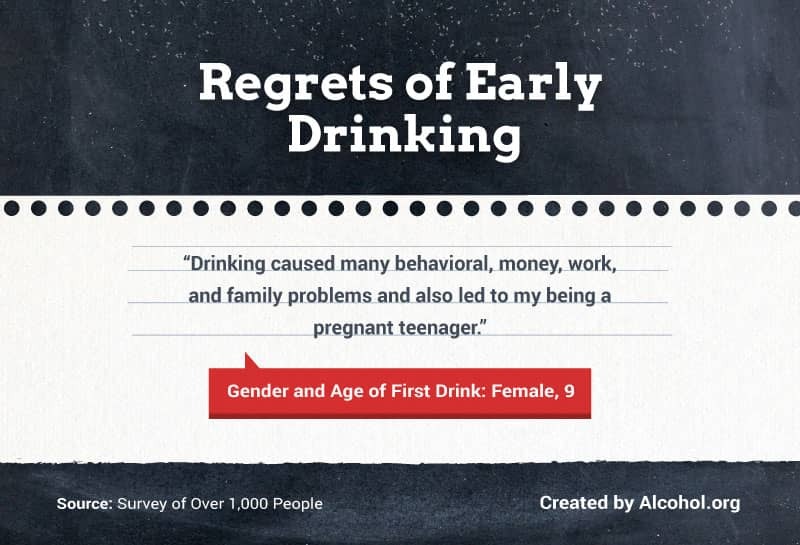 On average, those who regretted their decision to drink were just 15 years old when they did so. Here, you can see the extent of people's regret in their own words. One man who was 15 years old when he had his first drink said drinking led to a DUI when he was 18 and losing his license. It's not uncommon for those experiencing alcohol use disorder to put themselves and others at risk, as it is a listed criteria in the definition of this particular disorder. A woman recounted her early drinking age and the problems in her life resulting from it. For many, drinking young led to scary and dangerous situations they went on to regret later in life. Every year, thousands of people die as a result of alcohol consumption – from fatal automotive accidents to complications with excessive drinking. For many people, the behaviors associated with risky and binge drinking start at a very young age. Even with parental guidance or support, teenagers and young adults can still make bad decisions when it comes to drinking. As those surveyed admitted, the consequences of those decisions can last a lifetime. At Alcohol.org, our goal is to help people of all ages understand the truth about alcohol use disorder – from the real effects of alcohol consumption to the treatment options available for those in need. If you or someone you love has substance abuse or dependency issues, we can help them. Before you assume you know all the effects of underage drinking, visit us at Alcohol.org to learn more. We surveyed 1,006 people between the ages of 18 and 76, with a mean age of 37 and a standard deviation of 12 years. Our survey population was 52.3 percent female and 47.4 percent male, with 0.3 percent of participants identifying as nonbinary. We asked participants about the typical number of alcoholic beverages they consumed per week as an adult, their first drink experiences, and the variety of alcohol they consumed. 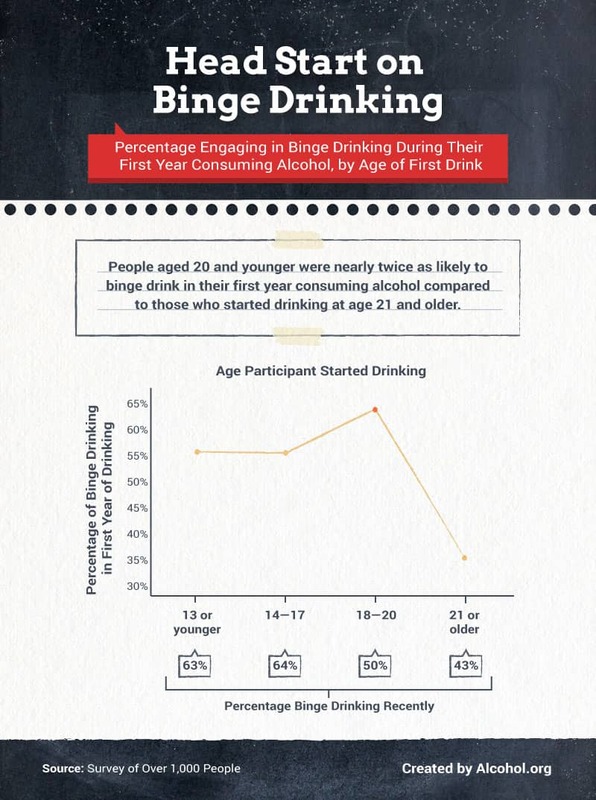 We used the Centers for Disease Control and Prevention's definition of binge drinking for men and women to determine the binge drinking behaviors of our survey respondents. Data were not statistically tested, and this study is an exploratory look at how early alcohol consumption may influence adult habits.